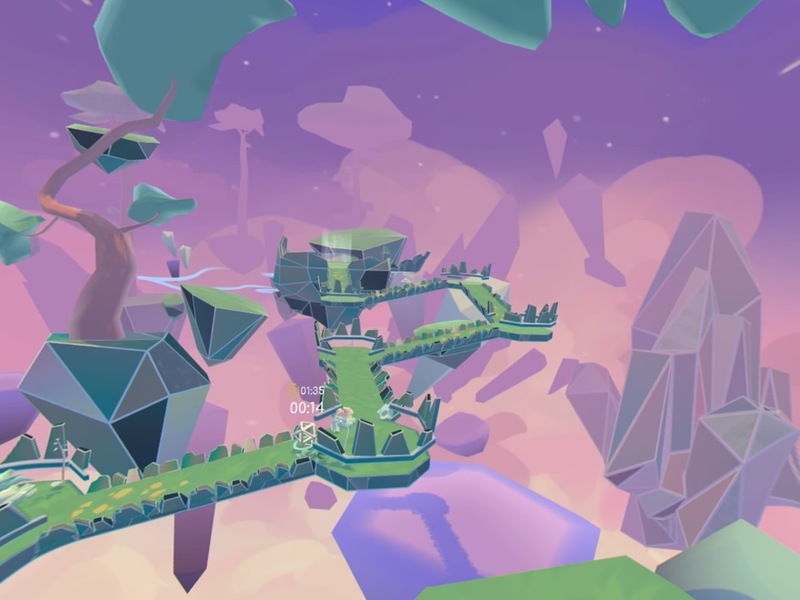 Arca’s Path is the debut console release from Dream Reality Interactive, a London-based developer staffed by ex-Sony coders and is a PSVR title that isn’t exactly easy to classify. On the face of it, it shares common traits with Super Monkey Ball. You view the action from behind and have to steer the ball along narrow paths and around obstacles while the game’s physics engine generates enough inertia at you to make these simple tasks a little more taxing. Others have compared it to the classic coin-op Marble Madness as well which is also a fair comparison. Older gamers may remember Spindizzy which came out for the various 8-bit home computers and was also another physics-heavy, steer ’em up that involved navigating treacherous paths and being afraid every time a downward slope forced you to go full speed into your next turn. The game offers some sort of basic story via some introductory static images in a stylish comic book inspired style. I had no idea what it was trying to tell me though and so I was more interested in getting into the action which follows very quickly as the plot here is paper thin. Once you get into the gameplay properly, the concept is pretty basic. You have to get from the start to the end. Movement is entirely hands-free. Your on-screen avatar, a small wireframe ball, follows a cursor and that cursor is controlled by head movements using the PSVR headset. We’re used to using head movement for aiming in the many turret-shooters that are out there for PSVR but using it for movement is pretty novel. It works well though. The calibration is really tight and the controls are incredibly natural. This feels like a game that non-gamers could pick up and play effectively right away and once you get used to the speed of the ball and the inertia that affects it, you can travel around with quite a bit of confidence. Indeed the difficulty curve is pretty shallow. 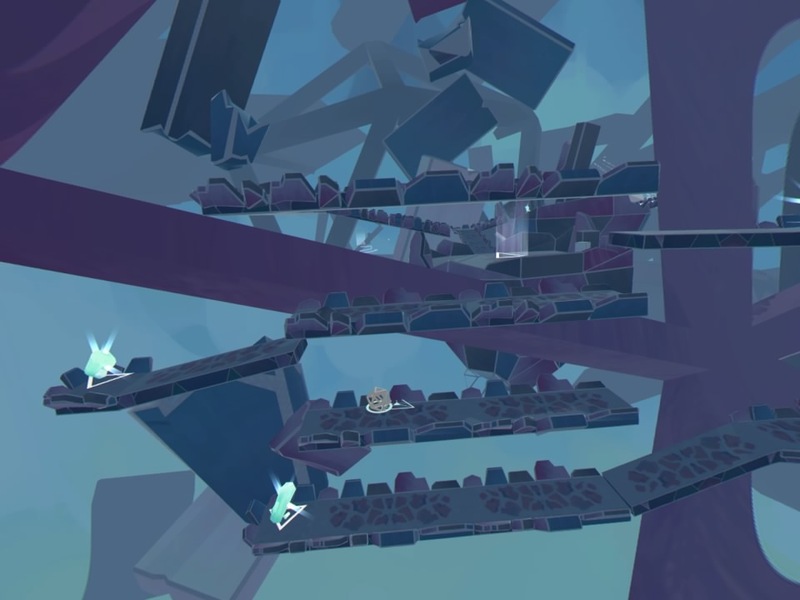 Arca’s Path starts off being pretty easy with most of the paths having the equivalent of guard rails on them but as the game progresses the paths get thinner and longer, the turns a little more risky and new obstacles and puzzle elements are added. 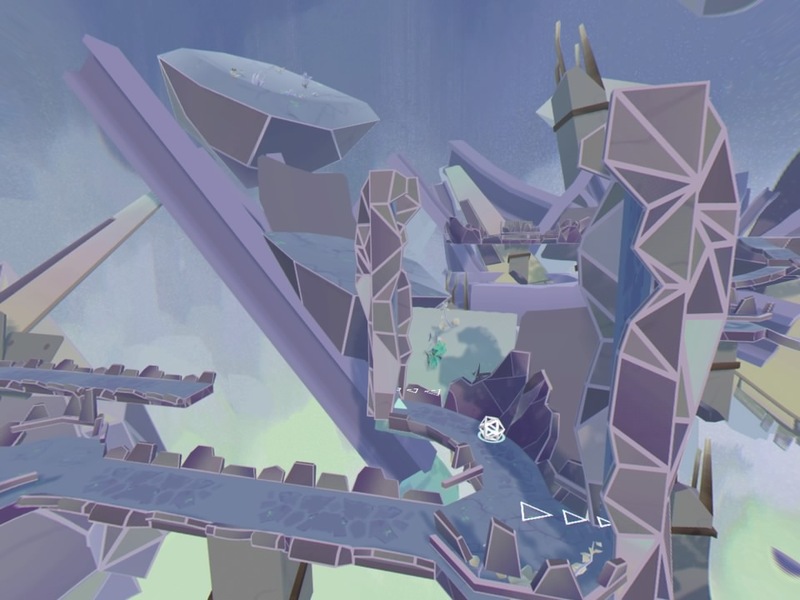 The game has 25 levels split across four chapters, each with its own aesthetic and a focus on slightly different obstacles. Where chapter three focused on pushable block puzzles, chapter four was more about see-sawing ramps. 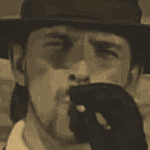 That said, the general style of the gameplay remains the same throughout. The worry with games like this is that the levels get too convoluted. That happened recently with Neonwall, another VR title where after an alright introduction, the levels became needlessly long and complicated, with each new one feeling like a chore. Arca’s Path manages to avoid some of those pitfalls by generally keeping the basic story mode quite relaxed and easy to get through. The task of getting from the start to the end of each level is generally relatively easy. 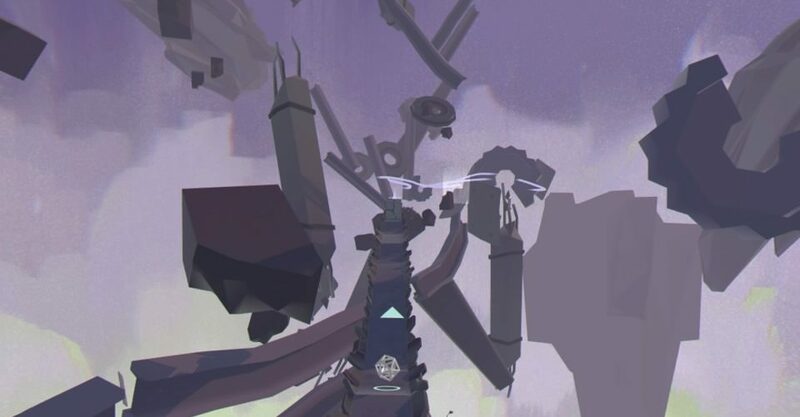 The puzzle element occasionally slows you down but it is always something you can figure out and to give you some extra depth, each level has several collectables. Get them all and you’ll unlock that level’s time trial and that’s where the real challenge comes in as you’ll really need to get good if you want the gold medals on offer with these, especially as you need all 25 to get the game’s hardest trophy. For the most part we enjoyed Arca’s Path. The levels did tend to be a little too long though and while some chapters only had a small number of levels, others seemed to go on for ages with their levels starting to look and feel very samey. Chapter two seemed to go on forever and by the end of it, I was kind of sick of seeing the same lavender-coloured look. That said, the overall look is very nice and clean with a sort of natural geometry kind of look that reminded us of No Man’s Sky and a little bit of Rez. However, the incredibly short draw distance however made us think of PS1 games like Nightmare Creatures and G-Police and we’re not sure if that was a design choice or a limitation of the programming. Often you don’t notice it but at other times you’re literally seeing textures pop in and out of existence with a mere nod of your head. The look is very calm though and the ambient electronic music suits it. The presentation isn’t going to blow you away but, overall, the game looks better than the majority of PSVR releases. The VR effect isn’t particularly powerful here but is used well in that it gives you a nice elevated view of the action. That said, we’re not sure if a non-VR version with more detail and a bit of HDR might have been an equally valid option. Overall we’re very happy with Arca’s Path. The controls are the star here and the level design is a close second. The lack of variety might concern some but this game sticks to doing one thing well rather than trying to cover too many bases and if it only had one job, which is creating a physics-based movement puzzler, it nails it. 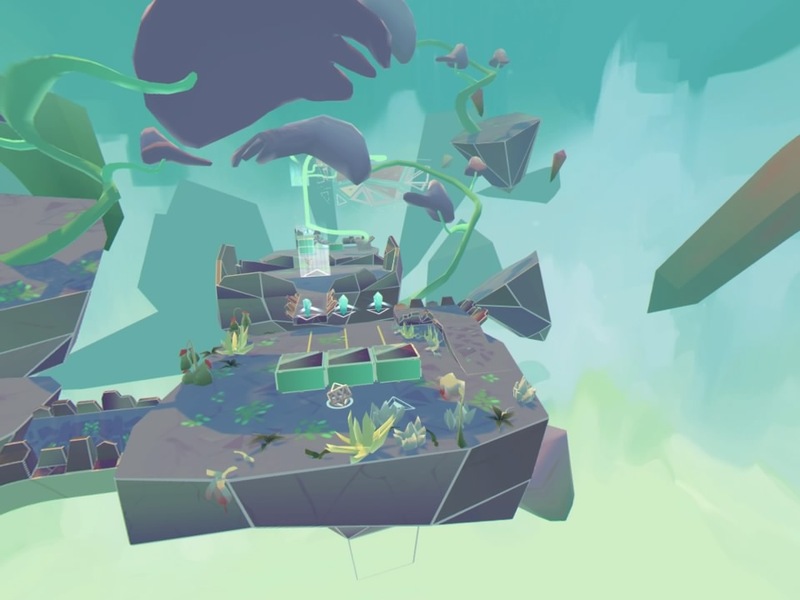 Arca's Path is a bit different to all those turret shooters and horror games that you've been using your PSVR headset for but we really appreciated its calm aesthetic, excellent controllers and well thought out gameplay.